Have y’all been following the insult to Former Marine Dan Moran by Katrina Pierson? She called him “deformed” and said he is being exploited because he endorsed Lieutenant David Dewhurst for Texas Senate. Here’s the archived page. Here’s Dan’s tweet: “Daniel Patrick Moran ‏@DanMoran_ My face might be 'deformed' but not my character & honor! 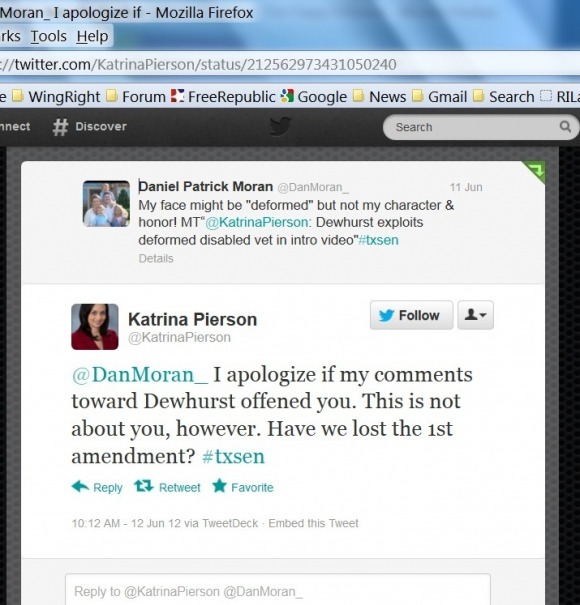 MT'@KatrinaPierson: Dewhurst exploits deformed disabled vet in intro video'#txsen”"
Here’s Katrina’s "apology": "Katrina Pierson ‏@KatrinaPierson @DanMoran_ I apologize if my comments toward Dewhurst offened you. This is not about you, however. Have we lost the 1st amendment? #txsen"